I actually have to do laundry on a regular basis because my kids no longer can wear swimsuits as their daily attire! I also need to make lunches and dinners and breakfasts. No matter how much I prepare each night, mornings always seem to be hectic. Not stressful, just hectic. There is so much going on in a small amount of time. One of the most important things I can do for my family is send them off to tackle their day with full tummies. They will be energized and satisfied so that they can face their day learning and understanding versus thinking about “when is lunch! ?” over grumbling stomachs. 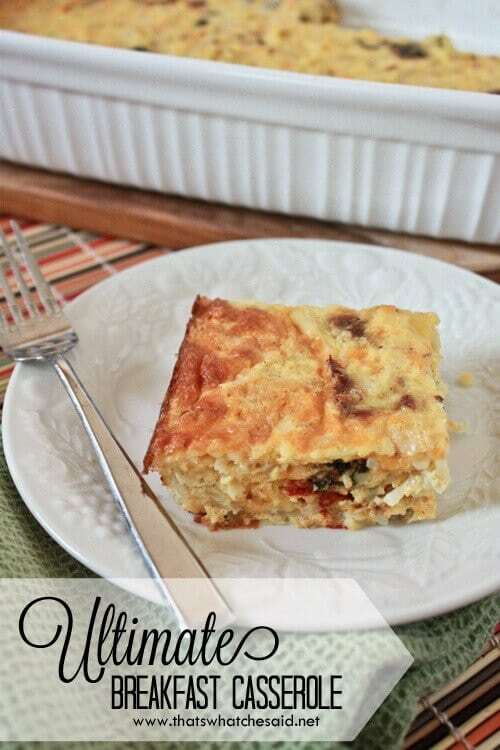 My mom trick is make ahead casseroles! Making these the night before lets me spend my time in the mornings finding missing shoes, writing lunch notes and helping make sure arms and heads make it through the correct shirt hole! I acutally make this while I am making dinner the night before, pop it in the refrigerator and bake the morning of. You can prepare this up to 24 hours in advance. 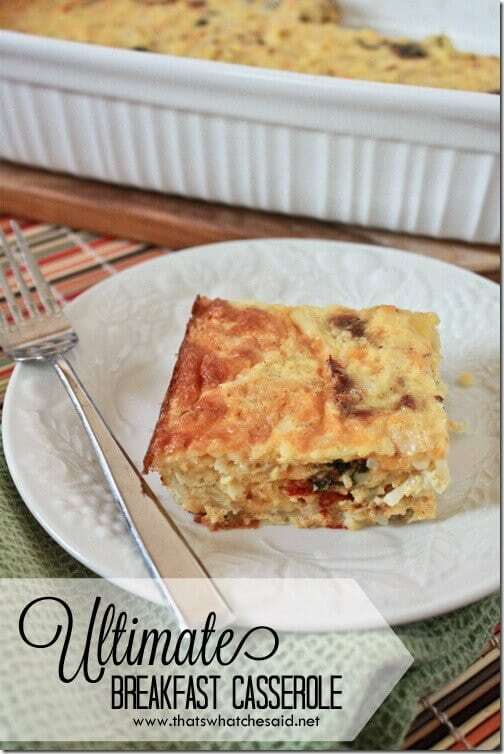 This casserole is perfect for busy mornings, brunch, pot-lucks, book clubs or MOPS meetings! I think when I make it again I will add some artichokes. They seem to accompany the spinach and sun dried tomatoes so nicely! 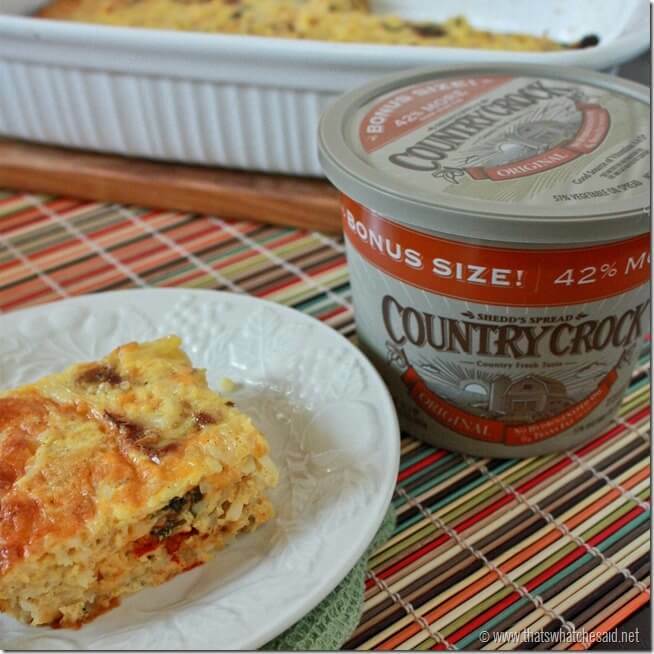 This casserole along with most every other casserole that I make is made possible with Country Crock! Country Crock has 0g trans fat per serving, no cholesterol and contains no partially hydrogenated oils. It also has 70% less fat and 30% fewer calories than butter. This casserole is beautiful served with some fresh fruit. My family prefers watermelon! Start by adding butter to a skillet and heat until melted and foaming. Add onion and garlic and cook for about 5 minutes. In a large mixing bowl beat 9 eggs. Add milk and mustard and season with salt and pepper. Wisk until incorporated. Add Shredded Potatoes and mix well. Add mixture from skillet and mix well. Pour into a baking dish sprayed with cooking oil. Bake at 350 degrees F for 35-45 minutes. 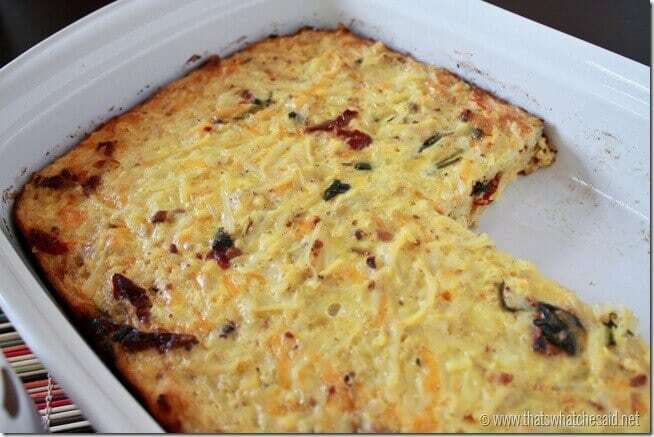 (If refrigerated, you might need longer cook time) Casserole is ready when the eggs are set and top is golden. Rugged Bear Sale at Zulily!